Javier Vazquez took another step back in his quest to right the wrongs of 2004. Vazquez saw his ERA balloon back up to 9.00 after squandering an early 3-0 lead by giving up 5 earned runs in only 3 2/3 innings. Even more than the poor results, Vazquez’ inability to find either velocity or command on his fastball is quickly becoming a major concern. In his Cy Young caliber seasons last year with the Braves, 50% of Vazquez’ pitches were fastballs, which averaged 91.3mph. In today’s game, however, Vazquez only threw 40% fastballs, by an unofficial account. Part of the reason Vazquez maybe reticent to throw the fastball in the zone, if at all, is because his velocity has been down. Coming into the game, his fastball was averaging only 88.8mph, and today 16 of his 31 fastballs were below 90mph. If Vazquez continues to struggle with his fastball, the Yankees may need to consider other options. 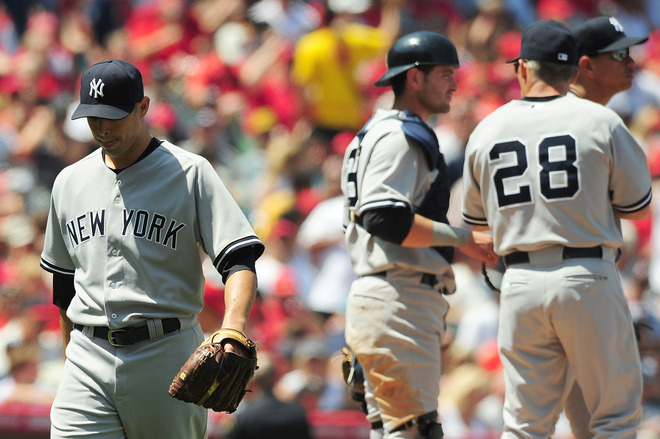 Javier Vazquez dejectedly walks off the mound after another poor outing (Photo: AP). Despite earning the victory, Scott Kazmir didn’t pitch much better than Vazquez. In fact, the only difference between the two is Kazmir didn’t have Marcus Thames in left field. Thames misplay in the 4th inning tacked on an extra run to Vazquez’ ledger, and that run could have been the difference in the game had Girardi not mismanaged the bullpen for the second game this series. With two outs in the 7th inning, and Alfredo Aceves pitching well, Girardi inexplicably decided to go with the under worked and inconsistent Damaso Marte. Even worse, Girardi failed to walk the dangerous Kendry Morales, instead allow Marte to serve up a game wrecking 3-run blast. By failing to win six straight series at the start of the season, the Yankees failed to tie a franchise record set by the 1926 ball club. Javier Vazquez is responsible for half of the Yankees losses. In his last match up against Scott Kazmir, Robinson Cano hit two HRs. In his first AB in today’s game, Kazmir hit Cano. The plunking, which occurred on the second pitch, followed a brush back on the first, giving the impression that there was intent. Later in the game, Cano responded by hitting another long ball of the Angels’ lefty. In his career, Cano now has 3 HRs against Kazmir, the most by a lefty. In the third inning, Bobby Abreu hit his 10th career HR off of Javier Vazquez, which is tied for the most by an active batter against an active pitcher (Manny Ramirez has 10 HRs against Jamie Moyer). In addition to his struggles in the field, Thames has also had trouble judging his home run swing. For the second time this season, Thames went into an early HR trot, but then had to hustle into second for a 2B when the ball failed to clear the wall. Girardi messed up with the pitching, but what about all the line-up changes, the past two games? I’m beginning to think he plays Pin the Tail on the Lineup, where he blindfolds himself and throws darts at their names to make his decision. Its obviously a problem trying to find someone to replace Damon in the #2 spot, but his decisions in the rest of the lineup make no sense either, at least that I can see. With Johnson out, the logical move seemed to be to insert Thames into the DH role and leave Gardner in LF. With the day off today, there was no need to DH Posada the day after he didn’t play. More than anything, Girardi has to realize just how bad Thames defense is. What’s more, he has to realize that Javy needs all the help he can get on defense.